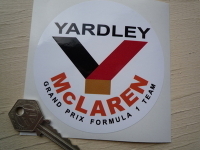 A pair of Reynolds Aluminium race car stickers. Machine cut to Oblong shape (cut up the the black edge, the white border you can see in the photographs is backing paper and is not part of the sticker). Each sticker measures approximately 300mm by 125mm. Goodyear Black on White Diamond Stickers. 6", 7", 8", 9", 10" or 12" Pair. Specialised Moulding Ltd Blue & Foil Sticker. 2". McLaren Black & Silver Stickers. 4" Pair. Reynolds 531 Guaranteed Built With Sticker. 2.25". John Sprinzel Black & White Oblong Sticker. 4"
Schmidt & Goerke Black & White Oblong Roll Cage Überrollbügel Sticker. 4". Pure Blue & White Round Stickers. 4", 5", or 6" Pair. 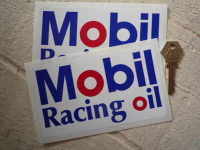 Mobil Racing Oil Oblong Stickers. 6" Pair. Smeg Black & White Oblong Stickers. 3" Pair. I Know Spankey Smith Circular Sticker. 3". Sedan RAC Rally Black & White Oblong Sticker. 6". 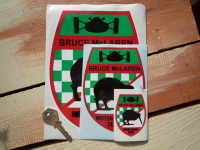 Sedan RAC Rally Black & White Oblong Sticker. 12". STAW Cut Vinyl Black or White Sticker. 8.5". STAW Rally Black & White Oblong Sticker. 9".